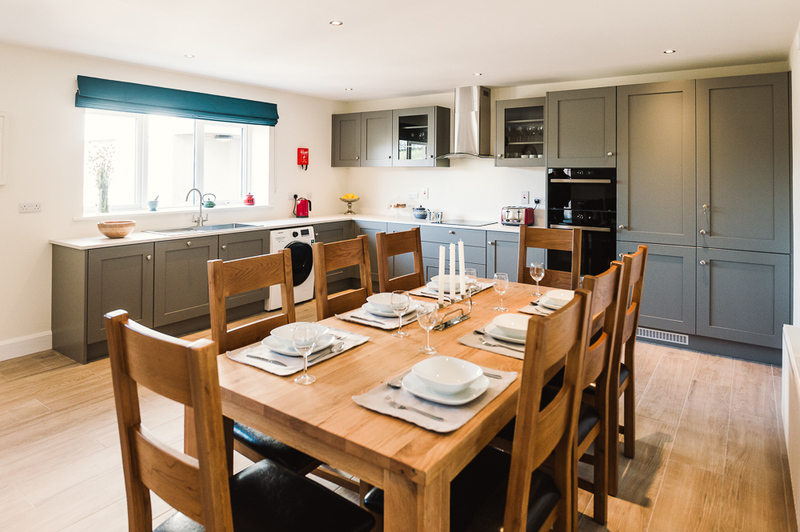 Three luxury self-catering holiday homes available as separate guest houses, or together for groups (up to 18, subject to bedroom configuration) or as part of corporate away activities, family events and residential courses. “The Barn House” has four bedrooms accommodating up to 8 + cot. The two mews houses have two bedrooms accommodating up to 4-5 people each + cot. The Mews houses are smaller versions of The Barn House (pictured). All bedrooms have generously-proportioned en-suites with shower. All properties have separate ground-floor bathrooms suitable for wheelchair access. Gas-fired central heating for out-of-season comfort. Book now (subject to Booking Terms & Conditions). Configuration of en-suite bedrooms is agreed at time of booking. The standard 4-bedroom configuration for “The Barn House” is two fixed-double (king-size) and two twins (optional as superking). 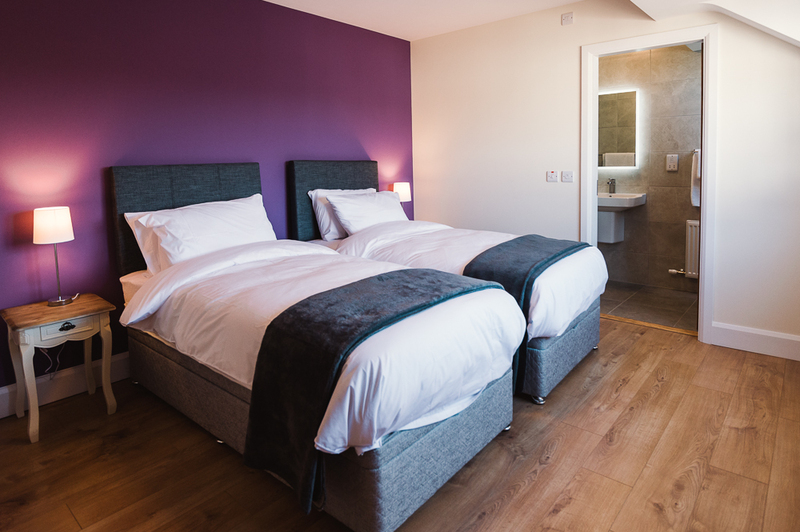 The standard 2-bed configuration for each Mews house is one double (superking, optional twin) and one twin-bedded (optional as superking) to suit most guest requirements. One additional fold-down child bed is available in each mews house only. One travel cot & high chair provided per unit. 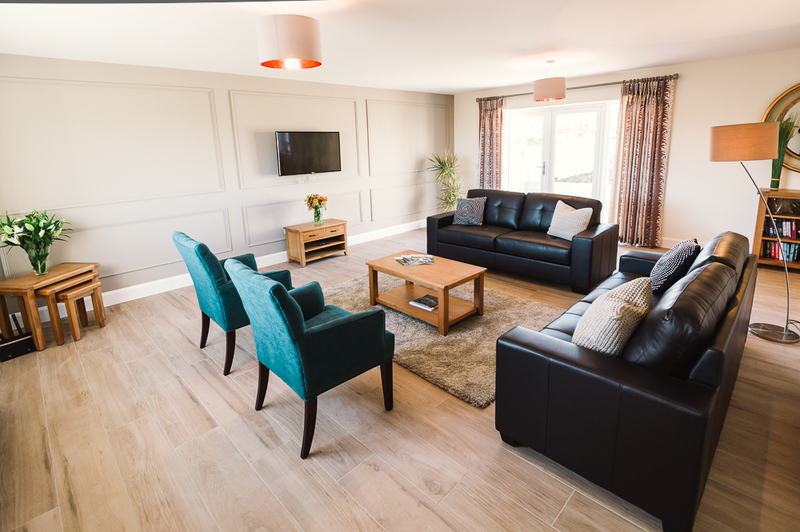 All guest houses include gas central heating and a lounge with satellite TV, free Wi-Fi, south-facing patio as well as fully-equipped bespoke kitchens. Great attention to detail has gone into the layout and interior design of the properties to provide space, luxury and practicality. The accommodation offers a low-allergen interior space. The old stable yard has been converted to a courtyard garden. Two acres of the private grounds of Ballynoe House are included as an amenity for guests, including wildflower meadows, seating areas, play field, formal gardens and a 400m woodland nature trail with fairy doors. Generous off-road parking allows Ballynoe House to host several teams and their support vehicles for the annual West Cork Rally (St Patrick’s Day weekend in March). Local amenities include several beaches within a short walking distance and a local pub/bistro. We are generally on hand to provide guests with assistance, especially if new to Ireland or West Cork. Guests can explore their family history using the resources of the resident genealogist, and discount offers are available for bona fide artists who book directly with us. Subject to availability, guests who book direct* may benefit from an earlier check-in, later check out or an additional night free of charge. There is a 10% high-season discount for returning guests. *We support the “Book Direct with the Owner” movement for cheaper and more sustainable tourism.